Try our all-rows back and traps workout to bring that back taper in! Contests are won from the back. ‘Nuff said. Now the question is, “How do I get that awesome back taper that I see guys like Sadik Hadzovic and Jeremy Buendia with?” Simple. Hard work and solid nutrition. Most people I talk to seem to think they are doing both. When I end up talking with them and get down to brass tacks though, we discover just how far off their idea of both is – at least, to accomplish that epic back taper. You can’t have an epic back taper without a solid nutrition plan. This is twofold in that first, you need to eat right to build lean muscle mass – especially when doing the workout below. Second, the classic v-shape back taper can only be achieved if you mid-section is on point. The only way to get a lean mid-section, is to eat for your goal. Now the caveat is that everyone’s body is different and so there is no single nutrition plan that is a “catch all” so to speak. The solution, is getting it dialed in by a pro. Nutrition is a science and you can’t guess your way through it. That’s why we here at Body Spartan have developed our nutrition program in the Genesis Program. 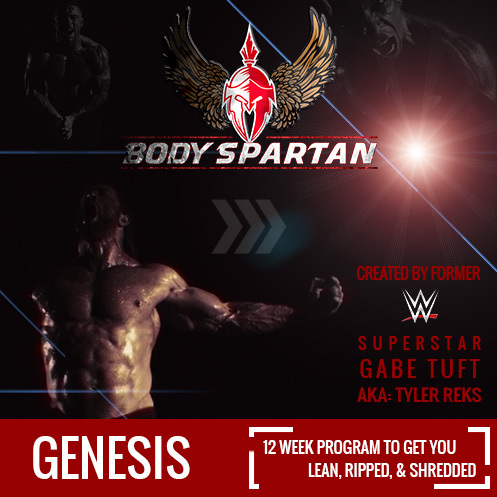 The rest of the back workout is below, but first have a look at the Body Spartan: Genesis, the 12-week transformation program! Body Spartan Brand Ambassador, John Foster, designed this killer back workout that also targets the traps. The workout is all rows, which will target your lats in a completely different way than you’re used to. The result is a shock to your muscles…and that means growth – IF YOUR NUTRITION IS ON POINT! Use the heaviest weight possible to get the reps listed. Increase the weight each set to increase the stress placed on the back muscles. Pull both arm simultaneously. Sit straight in the seat, keeping your chest against the pad. Do not allow your chest to leave the pad. Strict form is essential to target the back muscles properly. Stand straight up with your legs set approximately shoulder width apart. Bend your knees slightly and perform the upper half of a deadlift movement. Begin by lowering the weight while keeping your back straight and slightly arched, head looking straight ahead. Perform only the upper half of the movement and focus specifically on keeping your core tight, using the heaviest weight possible but still achieving the reps. Focus on the mind-muscle connection and use only the spinal erectors (lower back muscles) to perform the movement. This exercise takes some concentration! There is a LOT of volume in this back workout and trap workout. Come prepared with your gallon of water and your intra-workout drink (BCAAs) – you’re gonna need them both. The huge amount of rows in this workout will definitely shock your back and foster some amazing new muscle growth. Remember though, you have to feed your muscles what they need to grow, which is why that custom meal plan is so critical! “Now go and be effing awesome”. Great workout videos and lifting advice.